Does getting to Sardinia seem difficult? Not many flights? Since the spring and throughout the summer, the island is opening its doors to visitors with an increase in direct flights from major Italian and European cities. Again this year the Olbia Costa Smeralda international airport is the most important in the North of Sardinia with as many as 84 domestic and international routes operated by the best airlines including low cost companies. So Sardinia is waiting for you! From March to October the Gallura airport will be connected with all of Europe, and anyone can come to the island and enjoy an unforgettable holiday by the sea! Easyjet has increased the flights to North Sardinia with Basilea, Geneva, Bristol, Manchester and London. Also Vueling company is promoting low cost flight deals from Barcelona, whereas Volotea connects Olbia to the Italian mainland with six domestic flights and three international flights from Nantes, Bordeaux and Strasbourg. Also in 2019 the Condor Airlines has been reconfirmed, as well as flights to Frankfurt, Hamburg, Munich, Hannover and Düsseldorf. 7S Airlines will perform a flight to and from Moscow and St. Petersburg. Alitalia flies to Olbia from Rome, Milan, Bologna, Naples, Pisa and Genoa, while Airitaly reinforces flights routs from Bergamo, Bologna, Milan, Turin and Verona. And once you get to Olbia, you will immediately encounter the renowned Sardinian hospitality. 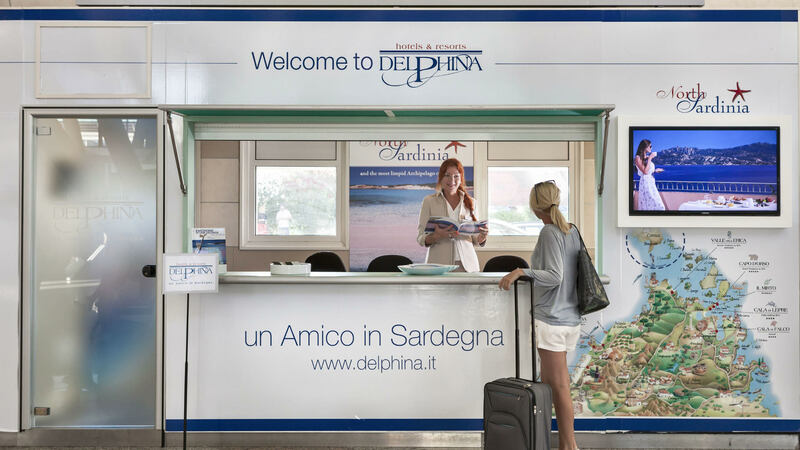 A Delphina Welcome Desk will give you a warm welcome to Sardinia. Operators will be available 7 days a week to make the arrival of guests in hotels and resorts as pleasant as possible, including reception services, information about the area, help for those who opt for car hire from Olbia, or transfer services. From the very first moment you will come to see these places as familiar. Just a few hours flight from anywhere in Europe will see you arrive at our island in the centre of the Mediterranean where a unique and unspoiled natural setting surrounded by the crystal-clear Sardinian sea will accompany you to the heart of an oasis of relaxation, discovery and fun! Are you already planning your holiday? Don’t miss out the offers for flight+hotel… Sardinia is closer than you think!